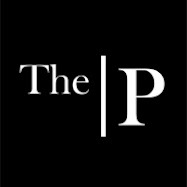 Wanna know what is cookin' in Poetry this weekend? Chili! Lots and lots of chili. 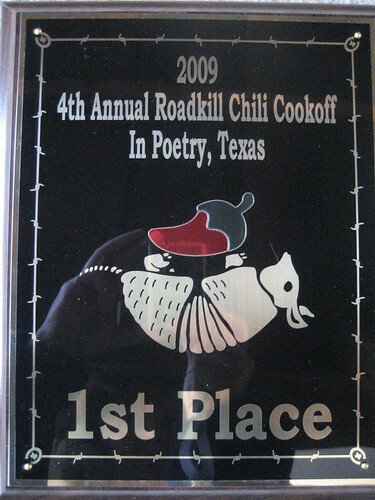 I am hosting the 4th Annual Roadkill Chili Cookoff at my place. This cookoff has grown from about 8 chili's and 20 people the first year, to last year's total being 17 entries and about 60 people. So far this year, we have 13 chili's entered and 50 folks have RSVP'd. Looks like it's going to be a beautiful weekend for it, upper 70's-low 80's. Who would not want to take this plaque home with them? As you can imagine, my list is long as my time grows short. I am ironing my vintage tablecloths for the outdoor tables. The lawn chairs are being brushed off. The flower beds have been planted and mulched. They look nice. Of course, the inside of my house is getting a little makeover, as well. As this event grows, I have higher expectations for myself. We'll see what I come up with. I use real dishes. Restaurant ware bowls and old coffee mugs, as well as finger bowls. Real, non-matching spoons. Mason jars for drinks. A garden cart with old refrigerator drawers for dirty dishes to be stacked in. The drawers are easy to pick up and take inside the house for cleaning. What else? Come on, you creative folks. Do you have any ideas? Bandanas as napkins come to mind! Sounds like a fabulous time! You are a brave lady! Hope you have a great party and loads of fun. That plaque is going to look so good in my gameroom! It sounds like you are going to have a great time. I'm not quite sure about "road kill", maybe I've been a city girl to long. The party sounds like a blast though! Sounds like a good time....how about a ladle filled with tums, chili pepper lights, oowboy hats filled with chips...Have fun and I agree you are a brave lady! Gayle, tums will be out in full force. Love it! Sandi, I'm going to check into the hay. Good idea. Deb, the ribbons idea? Love it! And your memory of my single boots is cracking me up. Good idea! Love the western photo idea. I am not sure if I could get them from Malisa in time. But, I might have a few of my own. Good stuff! That plaque is killing me! Haha. I absolutely LOVE your cookoff idea and can't wait to see pics from it. Have fun!